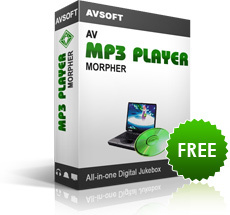 Free download MP3 Player Morpher - The only MP3 player that can morph! AV MP3 Player Morpher Basic is all-in-one audio morphing studio for digital music and movie editing. It features most popular audio formats, a CD player, ripper, converter, burner, recorder, and cover creator. You can morph music by changing voice, tempo as well as adding effects and beats. Play, capture & record music, convert, rip, and burn MP3s & CDs. Edit CD Cover & Label. Full functions included to make unique CDs, movies, audio & video clip. Write an online review of this MP3 Player Morpher and share your thoughts with others.